Dec 26, 02 Added Bravenet counter. Lost previous count. This started at zero. 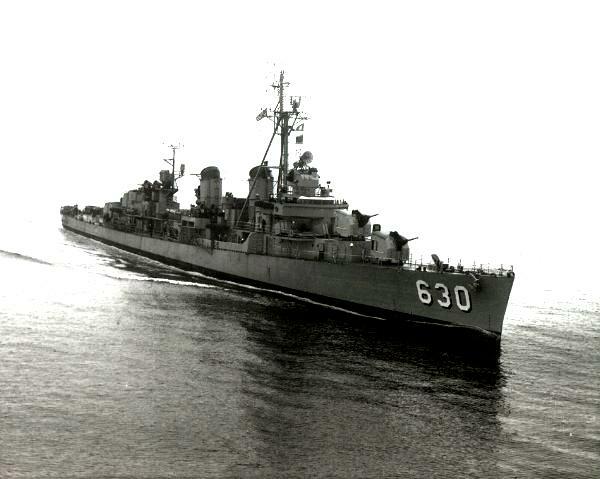 This web site is dedicated to the World War II Crewmembers and families of the USS BRAINE DD630. The 2006 reunion for USS BRAINE DD630 - will be 10-14 June, 2007 in Buffalo, NY. More info will be posted when received. Struck from the records on 10 August 1971 and sold to the Republic of Argentina. She was renamed ALMIRANTE DOMECQ GARCIA - D23. She served in the Malvinas Conflict (Falklands). She was decommissioned in October 1982. On 19 November 1986 she was used as target practice and was sunk by an Exocet missle. Her final resting place is 39 degrees 57 minutes South latitude, 57 degrees 57 minutes West longitude. Please check the spelling of the new Spanish name for our ship given by the Argentine Republic. I believe it should be "Almirante," not "Admirante." Sadly I must report that our ship after recommissioning in the Argentine Republic Navy, was in hostile action against our British Allies during the Falklands Conflict. (Note: David sent a list of the ships involved in the Falklands. A biggg file and I am not using. I ask Paul to check his source and he advised me the correct spelling is ALMIRANTE. I corrected above. Visit Web Site of CAPT RW LOWMAN, CO, USS BRAINE 1960. Created by Claudia Lowman, His niece. Stories on Braine & other ships.